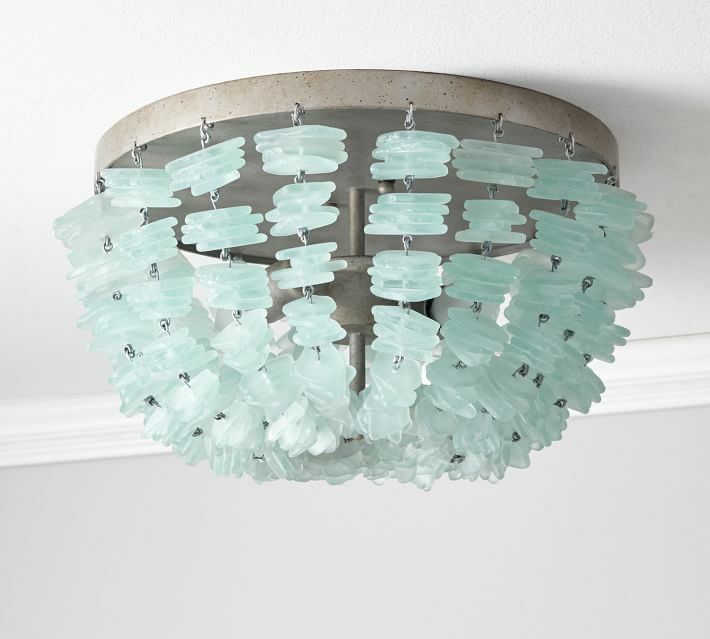 The naturally frosted finish of weathered sea glass gives this Enya Seaglass Flushmount a cool beachside appeal. 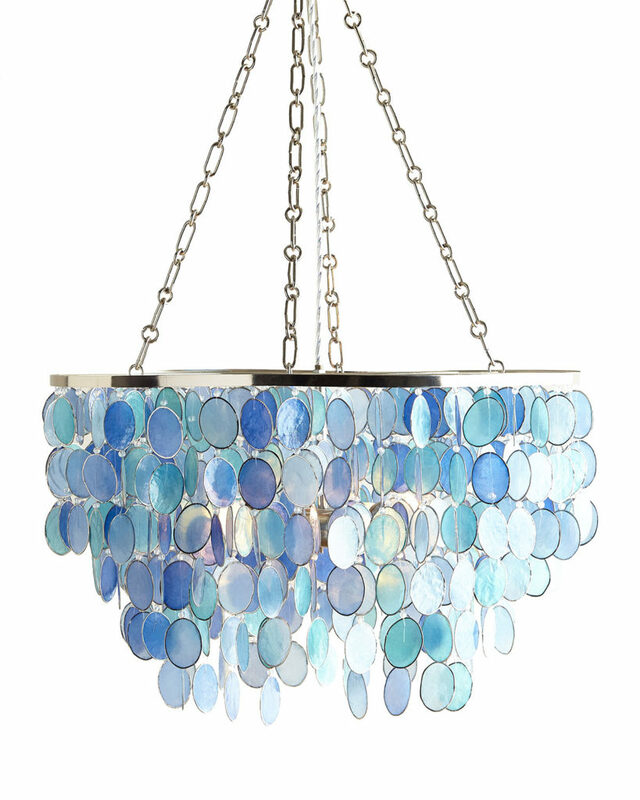 The soft hues beautifully complement the hand-applied antique-silver finish of the canopy. $499. Buy here. 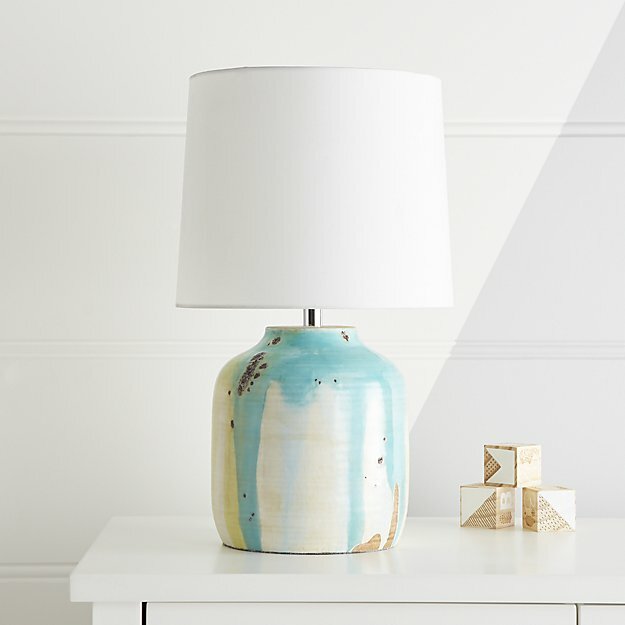 This unique Terracotta Drip Glaze Table Lamp features a freeform drip glaze on a terracotta base. 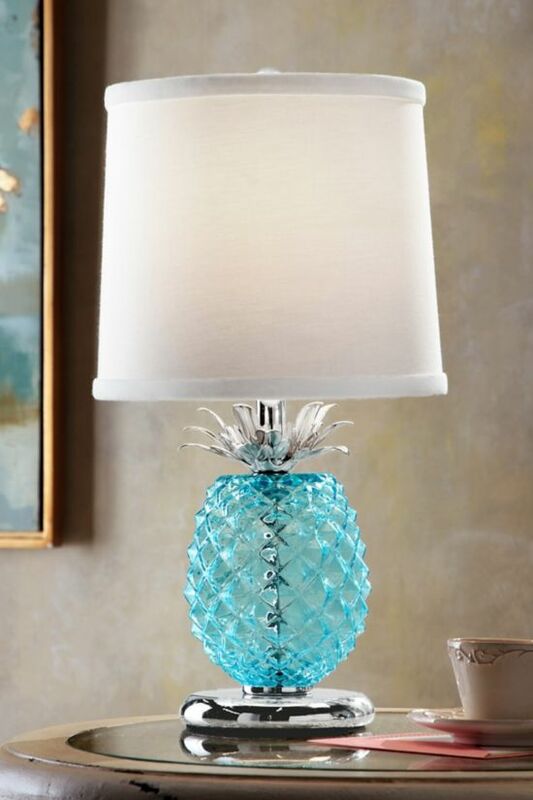 Sold complete with white lampshade. 9W LED bulb included with base. $99. Buy here. 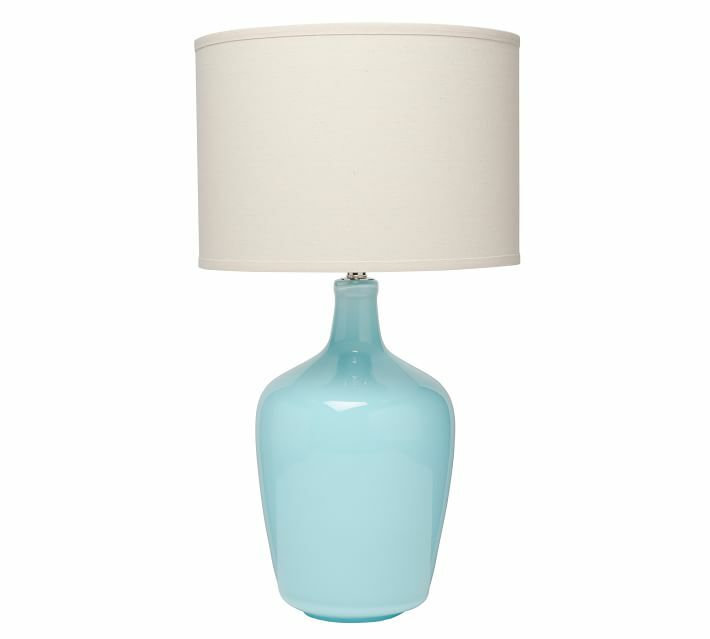 If your decor style is eclectic or romantic, this Turquoise Aubrey Accent Lamp will light up your world. 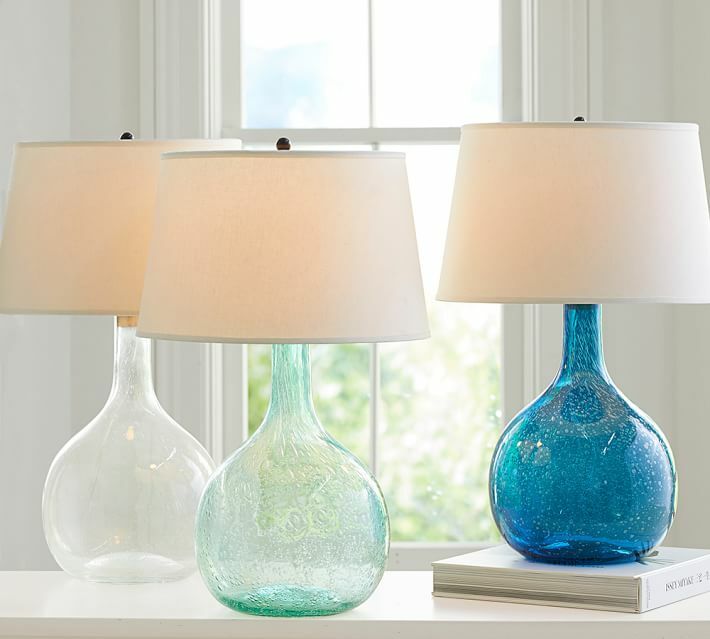 The curved design of the blown glass is perfectly matched by its soft pastel hue. $139. Buy here. 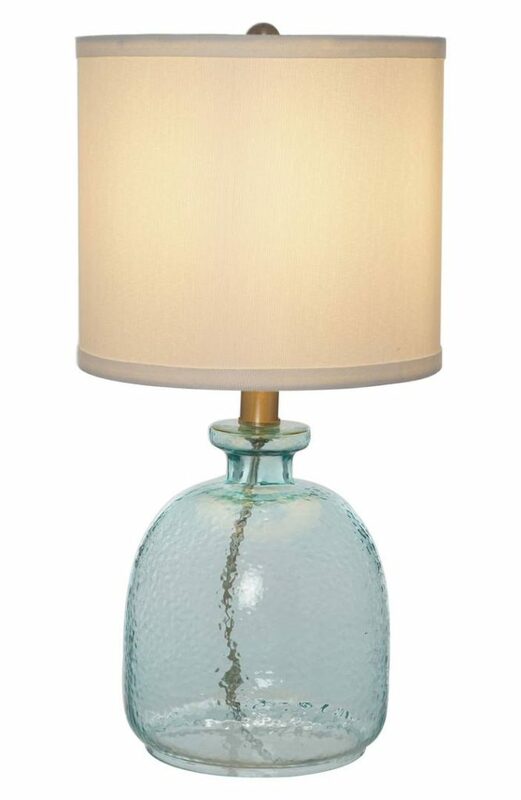 A dimpled, ocean-blue glass base lends soft seaside style to this lovely Ocean Glass Accent Lamp topped with a snowy drum shade. $59.99. Free shipping. Buy here. 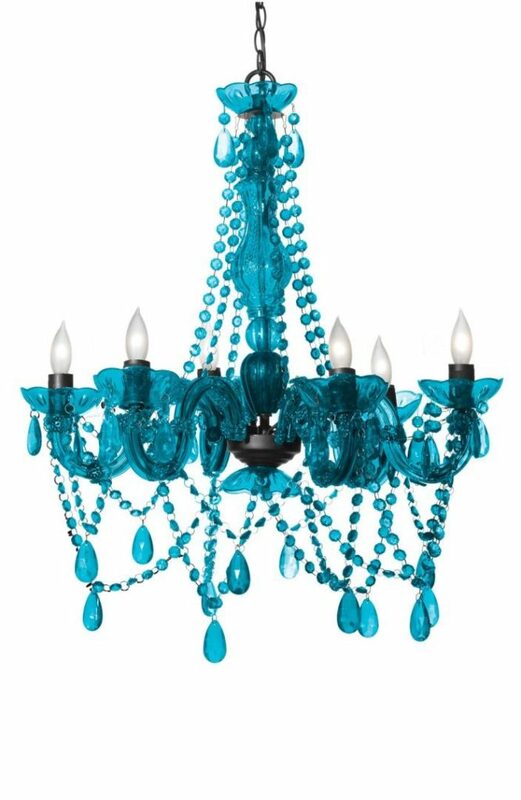 Turn any room into a palace with this six-bulb Turquoise Chandelier lavished with sparkling crystal strands and faceted drops. 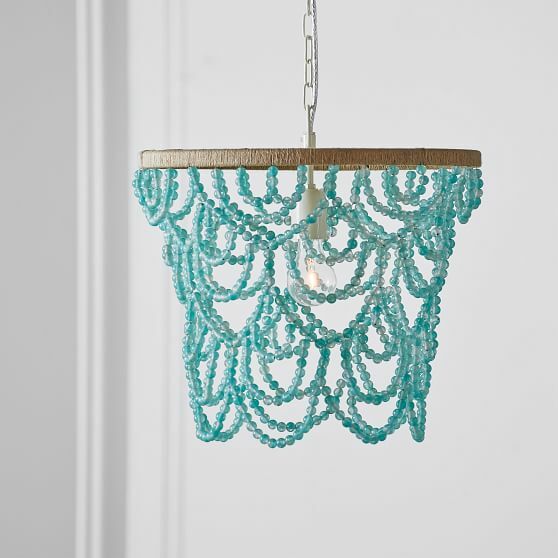 Easy installation and an extra-long cord allow it to be hung anywhere so your little (or inner) princess can redecorate on a whim. $140. Free shipping. Buy here. 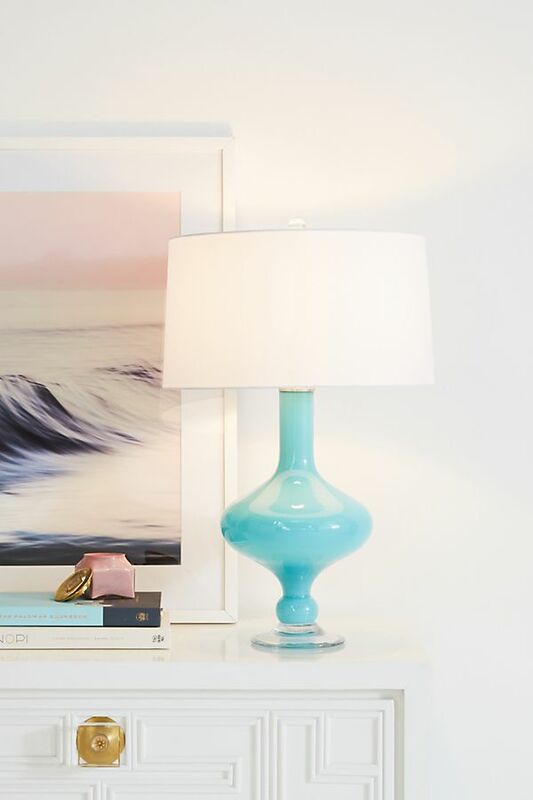 The base of the Ramona Table Lamp has the artisanal look of an antique cider jug. 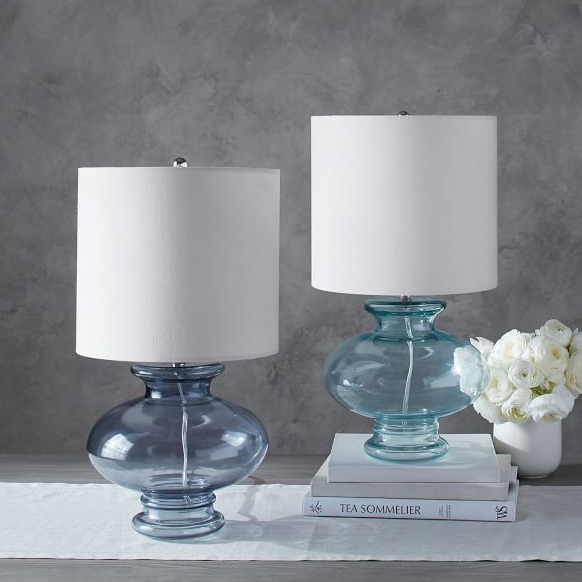 The sea-blue glass is paired with a pebble linen shade for a soft contrast in textures. $189. Buy here. 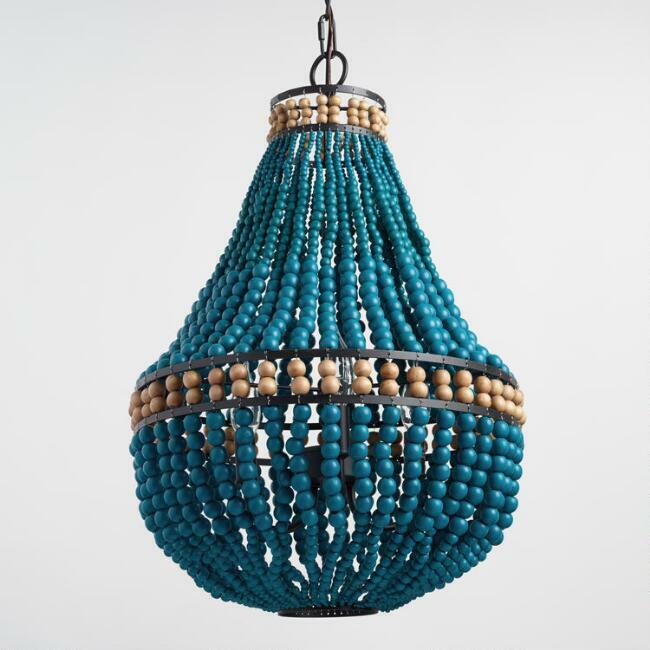 This handcrafted Mariana 3-Light Chandelier is draped in cascades of hand-cut capiz shell. Features brass and metal frame with silver-tone finish. $695. Buy here. 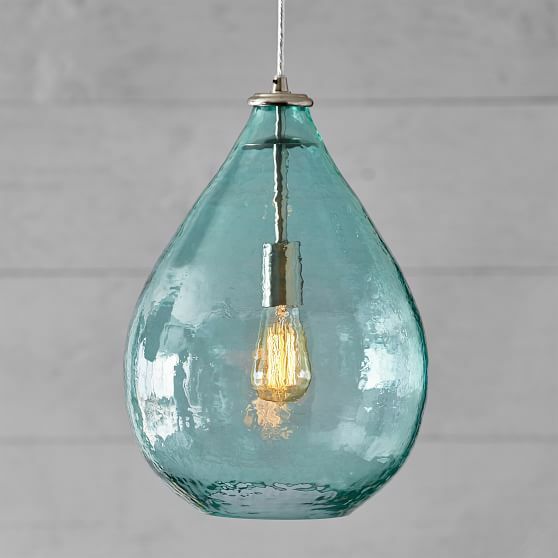 With stunning blown glass and brushd nickel accents, this Waterdrop Glass Pendant is sure to light up your space with a warm, surf-inspired glow. $159. Buy here. 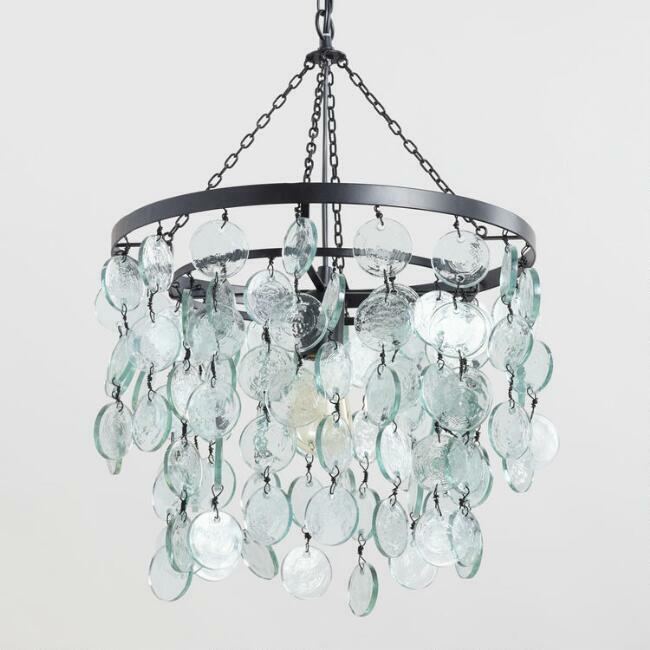 Add color, light and distinction to any room with this exquisite, handblown Salon Glass Pendant Canopy. 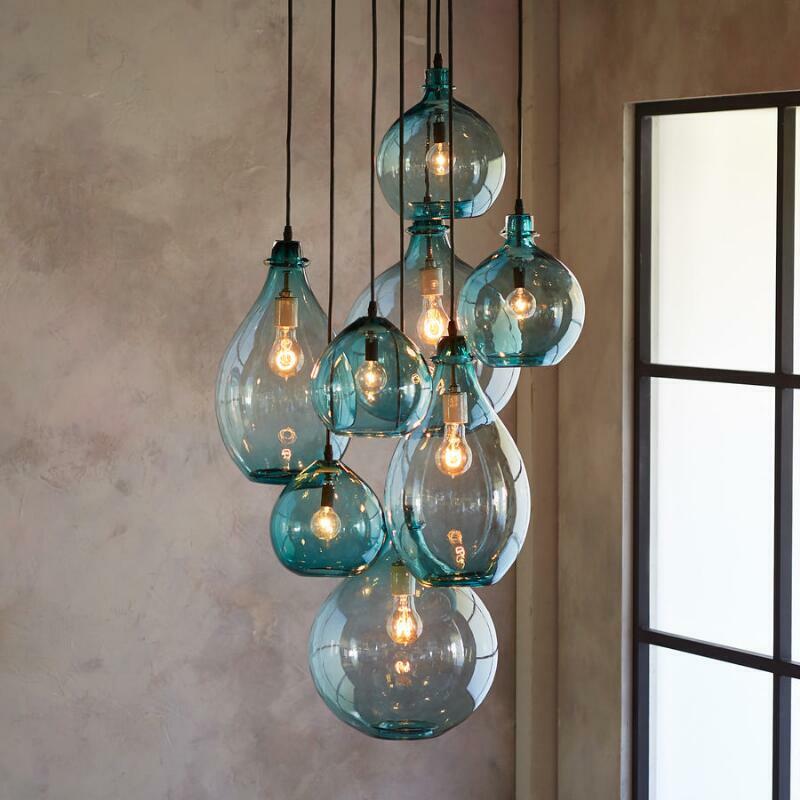 Limpid turquoise drops of hand blown glass, envisioned by Los Angeles artisan Cisco Pinedo, cluster together beneath a hand wrought iron canopy, creating not just lighting but the focal point of any room. Eight lights. Hardwire only. Made in USA. $3,995. Buy here. 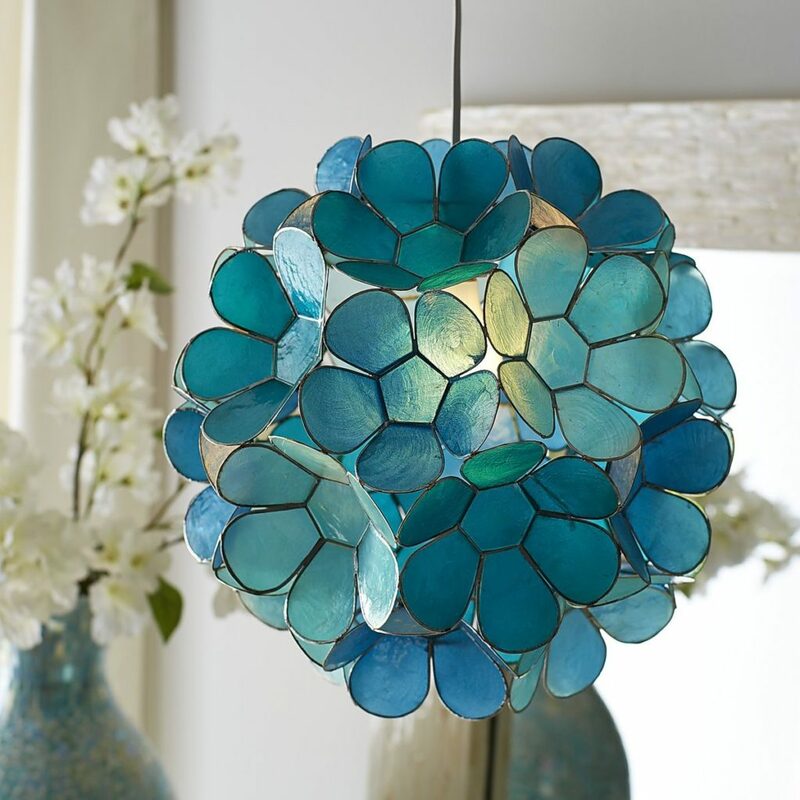 Symbolizing purity while providing pure brilliance, this Daisy Capiz Pendant Light is a shimmering natural. The source of its beautiful blue glow? 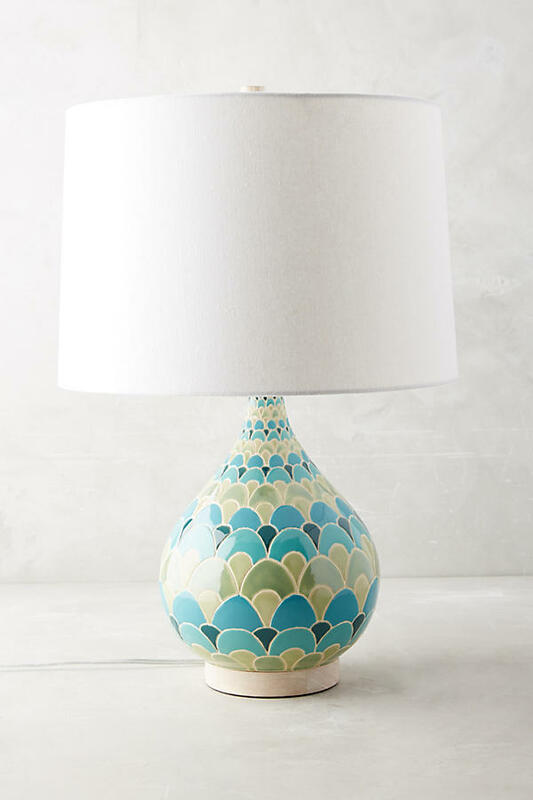 Capiz shells painted aqua and teal then hand-formed into floral blooms. $129. Buy here.